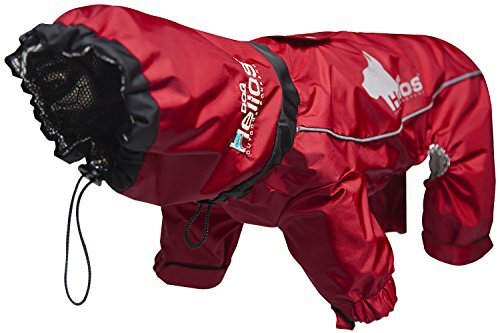 The Helios dog weather-king ultimate windproof full bodied pet jacket is inner-lined with Exclusively developed Black shark heat-retention technology that reflects and maintains your pet's body heat back into the body, this innovative fabric is lightweight, waterproof, impermeable, windproof, snow proof, breathable and tear-resistant while retaining any lost body heat during those frigid weather conditions. Additionally the Helios weather-king jacket features a waterproof Treated lightweight polyester blended outer shell with added proprietary coatings that add the to durability of the outer shell. The outer fabric also features surrounded reflective 3M tubing for safety during night strolls or during any extreme activities and features Velcro adjustable sleeves to further prevent any colder air from seeping through the sleeve areas. The weather-king dog jacket further features an additional adjuster by the neck area and the hood completely opens closer to the facial area to protect the face from any type of frostbite as one of the most important Coverage areas which is also adjustable. Features connector Belly and chest Velcro closures for added warmth and support for a more customized fit. Features leash slit holder at the back-side with accented embroidery and print on the outer shell. Get outdoors with Helios dog! available in multiple colors and sizes. Sizing guide: from back of neck to tail area ("in" Inch) 8" : extra small 10-12": small 14-16": medium 18-20": Large 22-24": extra Large. If you have any questions about this product by DogHelios, contact us by completing and submitting the form below. If you are looking for a specif part number, please include it with your message.